A long day of painting can be quite exhausting, and Barbara clocked out and went to sleep hours ago! Her batteries will be recharged in the morning, and mine will be dragging! I think you’ll be pleased with the progress on the bodega floor. Enjoy the photos! 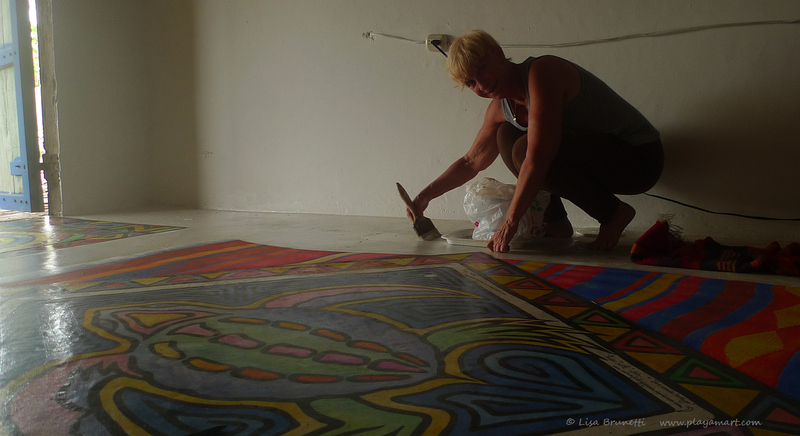 Barb floats color on the magic carpet. 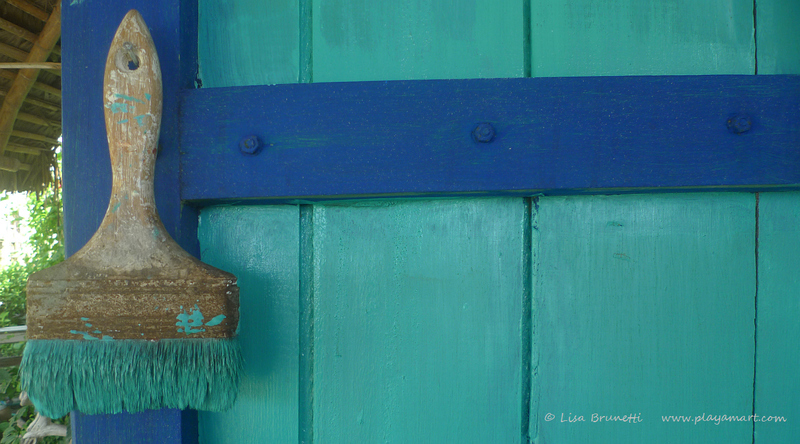 Lisa strengthens colors one wash at a time. Magic carpet progresses; bodega doors get Barb’s attention. Wednesday, April 3 – The doors look a little bit happier, don’t you agree?! We have a long way to go, but look how far we’ve come! you are so right! the ‘if fish could fly’ painting surely has true miles and miles of lines! it’s patiently awaiting my attention! It’s looking gorgeous. All of it. thank you so much! it’s rewarding to watch it evolve! Fruits of your labor…beautiful ! You’ll be ready for a two day siesta when you’re finished. hey! i worked late tonight, and barb’s been hanging with me really well. yes, we’ll be ready for a siesta for sure! by the end of tomorrow/sat, we’ll have made a lot of progress! yes, one does feel quite light in spirit when the room embraces us with a cheerful smile. Bodega doors look great. The whole project is amazing.Putting washes on is more time consuming, but look at the results. si, i worked late tonight on washes, but wow, is there ever depth in that magic carpet! shucks? you didn’t purchase that dream home on april 1st? i was already planning to come work for you for the next year as your resident artist at the exclusive inn! I may have some very exciting news to share soon… So hold that thought, because I would love a visit from you! Thanks! That floor is amazing!!! we just finished a painting session and are about to head to town for supplies and a mental/physical health break! thanks! the finish on these floors costs about 80 dollars a gallon and is well worth the expense. it’s clear and dries in about an hour to a rock-hard finish. unless someone walks in with grit on their feet, the floor stays pretty. people often think they are walking on real tiles and rugs until they prepare to wipe their feet.. then they all but gasp… and then touch the floor.. and keep touching it in many areas. it’s quite fun to witness! Of course, it will be worth the investment…if I may ask, is it a local product? 🙂 I can only imagine your guests’ surprised looks when they realize they are standing on beautifully painted bare floors! it’s quite funny to witness people’s first impression of the floor. there was a similar product in costa rica made by a company in that country. **SUR”) i will look at the label of this particular brand and find out more info. 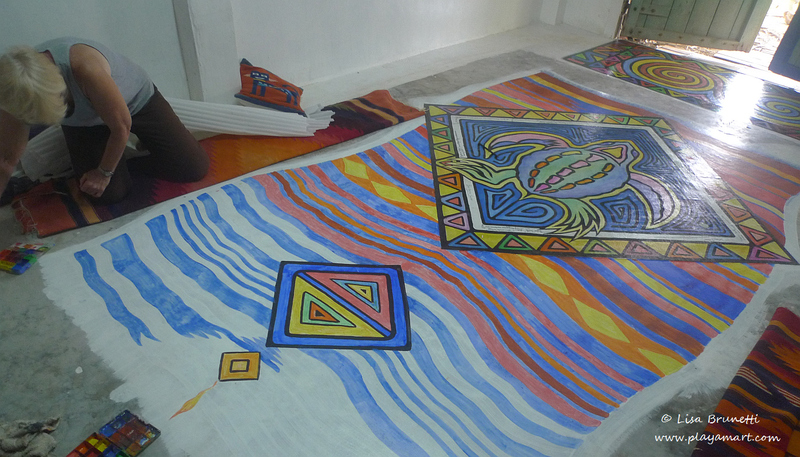 Magic carpet progresses!!! Gorgeous 🙂 Hope you and Barb are getting some sleep. i slept hard and long last night. barb said that she awakened around two and had a hard time going back to sleep last night – she wondered if it was b/c the river got so dead quiet. even the birds got quiet at some point! Very cool. I love it. I am getting the Steppenwolf out. Thanks for that tickler of a reminder. I promise, a post will emerge before this floor is finished, and it will be in your honor! This looks pretty fantastic, interested to see the detail once it is all finished! thanks! 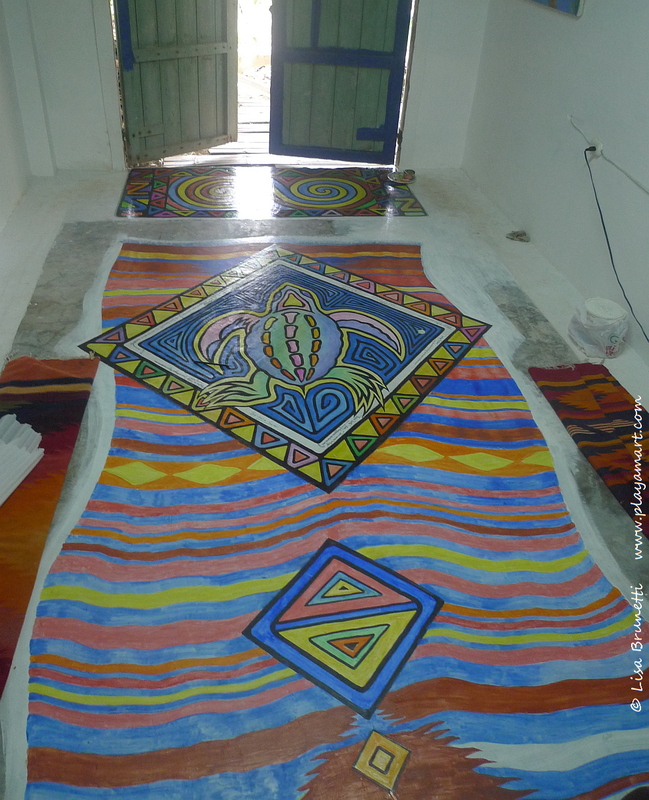 the work is going well – poco a poco, a lot of painting each day, but a little bit more of the area is covered with paint! What a beautiful floor, z! You are in good company with this floor – I visited the palace of the kings of Naples, Italy, and their floors looked like marble, but were really painted with a faux finish! Beautiful, but not as interesting as yours. ruth! what a beautiful comment! thank you so much, and today we’ll feel quite regal as we work on the next stage for the floor! Great fun! It’ll be a shame to walk on it. it really isn’t, believe it or not.. and walking barefoot on a cool finished and beautiful floor is quite nice. i’ll start asking everyone who walks on it to give their feedback.. report will emerge in a week or two! I really love the way the waves in the carpet bring it all together and enliven the work – and what a lot of work, and much progress. Is the turtle trying to return to the sea? yes, the turtle is sort of pointing towards the sea and up the coast toward the line of the equator! perhaps she’s buried her eggs and is now going home! i’ll be working on the carpet for most of the day and hope to have enough energy to share photos tonight! Looking forward to it – but be sure to keep up with the wine, too – or whatever the bev of choice is! Colorfully stunning! I love every brilliant inch of it. Rest well deserved. thank you! barb said that she normally has trouble sleeping all night, but she’s not had that problem after painting all day every day! i think that crawling around on a concrete floor helps keep me young! maybe it’s the exercise of getting up and down! yes, it’s a time-consuming task, but well worth it after that finish is applied and the floor glows! your last post was amazing! loved all of those photos of the students! so festive! last night i slept hard and long and awakened with a head full of dreams.. after sorting through my dreams, i was ready for the new day! painting will resume in about ten minutes! 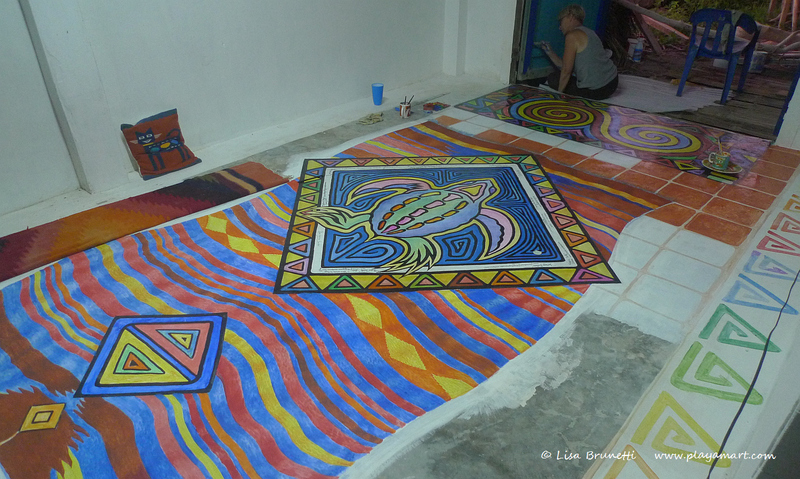 It’s fun to see how the painting on the floor develops and comes alive. It’s so beautiful and looks great in the bodega. But what happens when someone takes the «magic carpet» for a little flight? yesterday a friend was helping, and she said that she’d like for her friend to come see the floor. 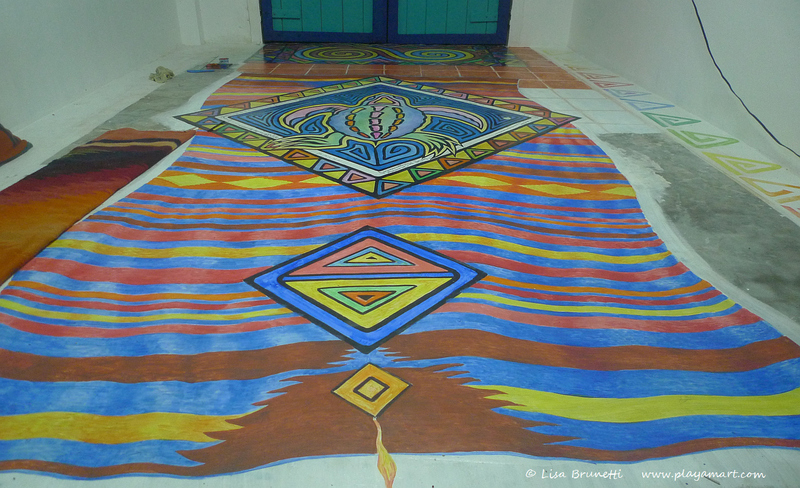 the flowing colors made her think of his descriptions of ayhuasca., her friend worked with and stayed with a shaman in peru! when the painting is finished and the varnish has been applied, we’ll have to make some festive drinks, pop a little popcorn and sit on the carpet and see what happens! shall we reserve a seat for you? i suspect that you’ll have another workshop there in the future, and maybe i can coordinate future travels to overlap with your bolivia ones. i need to lob a post from bob/piran cafe about taking photos in bolivia! will look for that now. I have done the Nasca Titicaca La Paz (the other way around) many years ago. It’s recommendable! buen viaje, and i hope that the workshop goes well. i’ll shoot my sights and wishes for october! Oh, take me on the magic carpet ride!!! We’re planning a trip to Ecuador next March and April. I want to see your amazing place in person. yes yes yes!!!!! it will be so great to see you in ecuador!!! i’ll be sure to have a special carpet ready for you! thanks! we should make strong progress today! thanks, as always! a calm gentle rain assures me that we’ll have a nice painting session this morning – we won’t be tempted to go outside! we’re both eager to get started! i love the title of your post this morning; kicking dead horses… that would make a great book title! Awesome Z! You and Barb must be dead tired, but so satisfied with how the rug is turning out. I love looking at the details – gorgeous free flowing work of art. The design show the rows and sides seeming to move like a rug – this is really spectacular. The colors are exquisite and perfect arrangement/placement of them! I have a feeling that you are going to be receiving requests from clients to reproduce this wonderful piece in their homes or places of business. Wow when the doors open and the sun hits the floor ~ perfect! dear dear mary! thank you so much, and yes, it’s heart warming when others appreciate the hard work and end result. barb will be thrilled to hear from the cheerleading squad! thanks! pom poms for you! That is what my pommipay and I need a magic carpet. Fly everywhere no security checks and it would be envoromentally friendly. Your bright colours inspires that bright idea. ‘Starry Starry Night.’ was another inspiration, thanks. thanks, jack! wouldn’t it be great if the two of you could soar over the pacific and land here in ecuador? that would be fun! yes, that song is a classic, isn’t it?! Wow, Z! Your work is remarkable! I have always been an admirer of tromp l’oil (sp?) 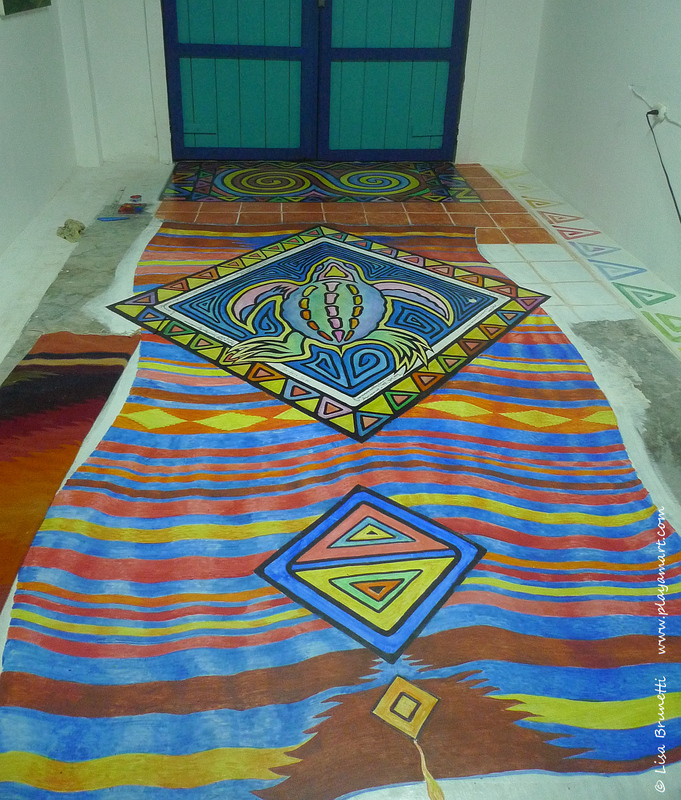 and your floor designs take my breath away! How long have you engaged in this kind of art? All I do is watercolor, and now feel quite small when I see how you are able to transform an entire environment. Congratulations on your work! I hope you’re finding great fulfillment in it. you nail your watercolors; therefore you could nail those details on a floor as well. i use watercolor techniques most of the time, adding layers of washes first and then drybrush. acrylics are more forgiving, but they are brutal on brushes. i am glad that you enjoyed the post! thanks so much for your comment!